Notes: Any tobacco product use is defined as past 30-day use of cigarettes, cigars, smokeless tobacco, electronic cigarettes (e-cigarettes), hookahs, pipe tobacco, and/or bidis. ≥2 tobacco product use is defined as past 30-day use of two or more of the following product types: cigarettes, cigars, smokeless tobacco, e-cigarettes, hookahs, pipe tobacco, and/or bidis. 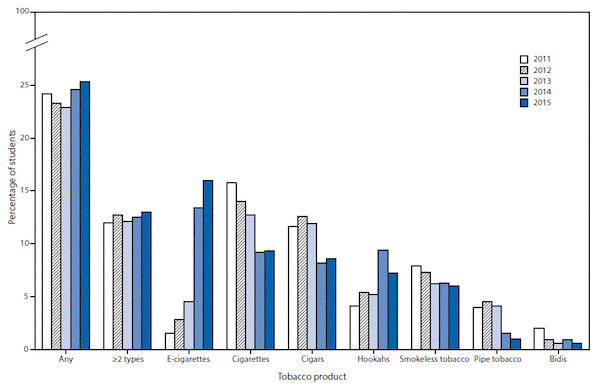 E-cigarettes and hookahs demonstrated a nonlinear increase (p < 0.05). Cigarettes and smokeless tobacco demonstrated a linear decrease (p < 0.05). Cigars, pipe tobacco, and bidis demonstrated a nonlinear decrease (p < 0.05). This entry was posted in Medicine and Society Data Watch on April 20, 2016 by Genevra Pittman.